To find out how courting peacocks get noticed by females, researchers put tiny head-cams on peahens and tracked their eye movements. “Surprisingly, the peahens are looking at the lowest edge of tail feathers and aren’t paying much attention to the rest of the five-foot tall displays,” says Jessica Yorzinski, a postdoctoral fellow in the department of biological sciences at Purdue University. 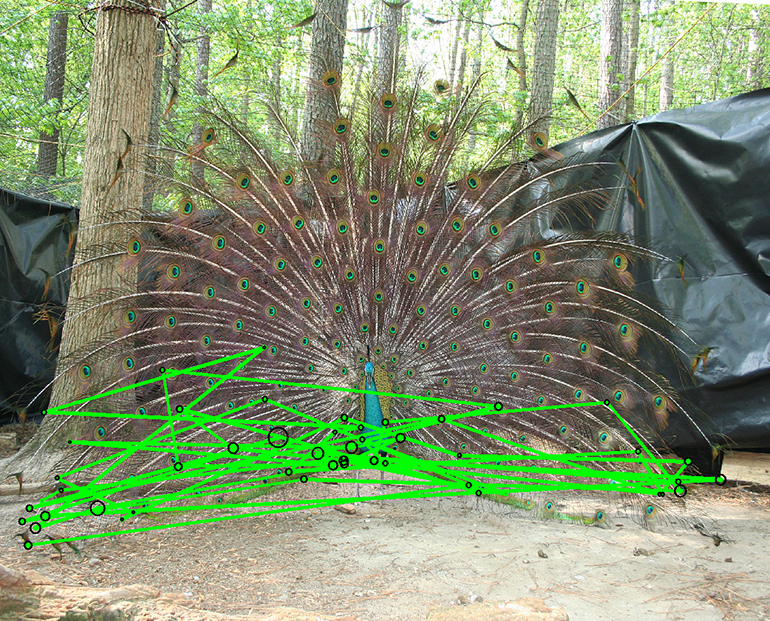 The peacocks have a tough time keeping a peahen’s attention as she evaluates her surroundings for food and predators, but the peacocks did have one way to turn heads, Yorzinski says. The study, published in the Journal of Experimental Biology, involved 12 peahens. Yorzinski used eye-tracking technology and tiny cameras to follow their gaze as multiple males vied for attention during the mating season. The study didn’t evaluate which males won a mate. Yorzinski conducted the experiments as a graduate student at Duke University and continues the research at Purdue.